Scientists had suspected that many dinosaurs had feathers, but microraptor fossils have been found with fossilized feathers, confirming that idea. Feathers covered the microraptor’s body and this animal even had feathers on its legs and feet. Scientists think it probably couldn’t soar in the sky like modern birds, but that it could glide from tree branch to tree branch. It had large eye sockets, which means it had good eyesight. Scientists have often speculated about what color dinosaurs might be. The Microraptor fossils contained preserved color cells. Scientists were able to determine that the Microraptor had shiny black feathers, like a crow or grackle. They’ve also discovered undigested food among the dinosaur’s bones. Scientists know that the Microraptor was a carnivore. It ate all kinds of things—lizards, fish, insects, and birds. Question: How big was the Microraptor? 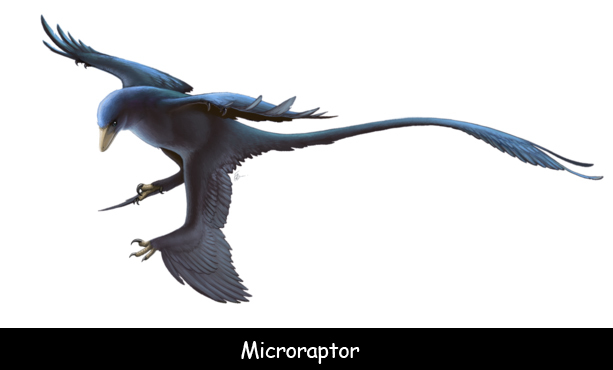 Answer: The Microraptor was the smallest of all discovered meat-eating dinosaurs. It weighed less than a pound. Find out more about this tiny dinosaur. Declan, Tobin. " Facts for Kids about Microraptor ." Easy Science for Kids, Apr 2019. Web. 21 Apr 2019. < https://easyscienceforkids.com/microraptor/ >.